It’s almost as if, with increasing attention being paid to breast cancer lately, the folks at R.J. Reynolds figured they could afford to help a few more women get lung cancer, and maybe no one would notice. Never mind that lung cancer already kills a lot more women than breast cancer does. R.J. Reynolds, the tobacco company, is about to start a new advertising campaign, at an estimated cost of $25 to $50 million, the foreseeable consequence of which will be the deaths of a lot of women. That’s the estimated cost of the ad campaign to introduce Camel’s latest sub-brand, “Camel No. 9,” which is aimed at women. Apparently Joe Camel has been a guy’s guy for too long. As of this year, he’s got an equal helping of love for the ladies. What can I say that’s not obvious? Yeah, cigarettes are legal, but not everything that’s legal is ethical. Sure, people choose to smoke…well, sort of. Most people start due to peer pressure (and advertising? ), and keep smoking because nicotine is addictive. But hey, everyone’s got a right to make a living, right? 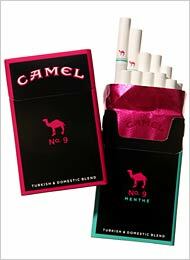 And sure, RJR says it’s only trying to attract women who already smoke to switch to their brand. But that’s neither plausible nor exculpatory. All of that is obvious. But I’ve said enough. Discuss among yourselves.